Heliopolis: ('Sun City', 'Anu', 'Lunu', 'On'). Shows evidence of occupation since pre-dynastic times (1). Several of the obelisks in Rome originated from Heliopolis, as did both the Cleopatra's needles in London, and New York. The ancient city of Heliopolis, the city of 'On' in the Bible, was the chief town of the 13th nome of Egypt (These nomes were ancient administrative borders with roots tracing right back to the unification by Menes (c. 3,100 BC). In Egyptian mythology its name was lunu, meaning 'pillar' and it was thought to be the location of the 'mound of creation' from which the world arose from the waters. The position of the great temple is marked by a single obelisk, being one of a pair set up by Senusret I, the second king of the Twelfth Dynasty) and a few granite blocks bearing the name of Ramesses II. Now buried almost directly under the sprawling city of Cairo, the archaeological context of this city remains are going to remain difficult to interpret. We know that there was a religious centre dedicated to Djoser Netjerikhet of the 3rd Dynasty. 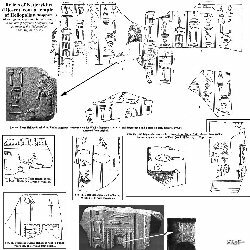 Several fragments of very fine limestone relief were found in the temple area at Heliopolis excavated in 1903 by Schiaperelli. 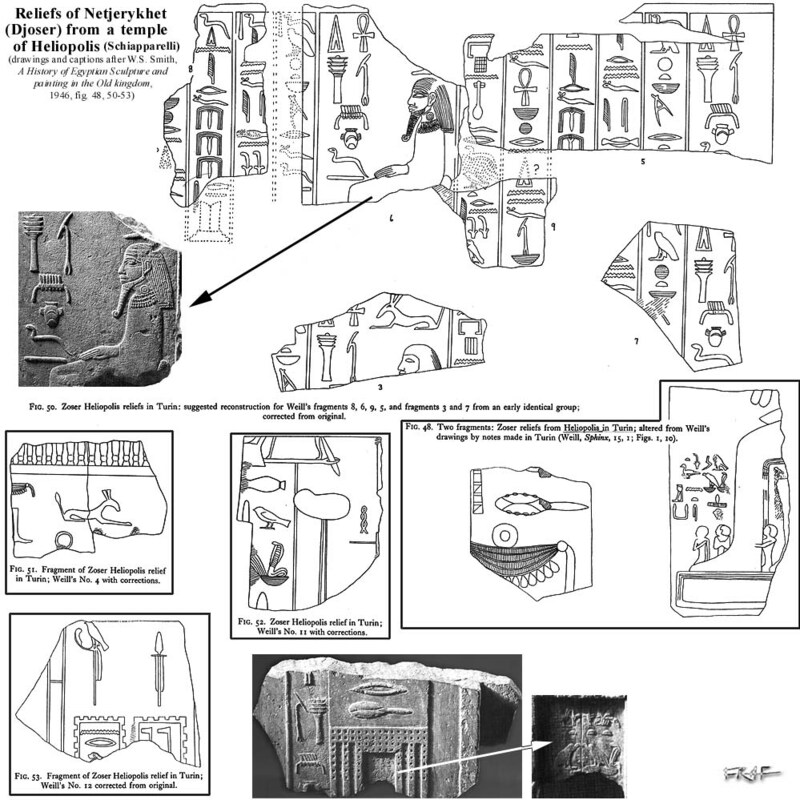 Now exhibited in the Turin Egyptian museum, the fragments show lines of text naming Netjerikhet, and stress the importance of the solar cult at that time. It can be seen that many of the pyramids of the 4th and 5th dynasty were positioned so that their corners aligned towards Heliopolis. It was Hans Goedicke who made the first suggestions over this theory, but they were not published first in a scientific journal, but in a newspaper in 1983. And what does the theory say? Well, Goedicke noticed that there seems to be a common constructional element at several necropolises: one corner of each structure is often on a straight line with the same corner of other structures in the necropolis. 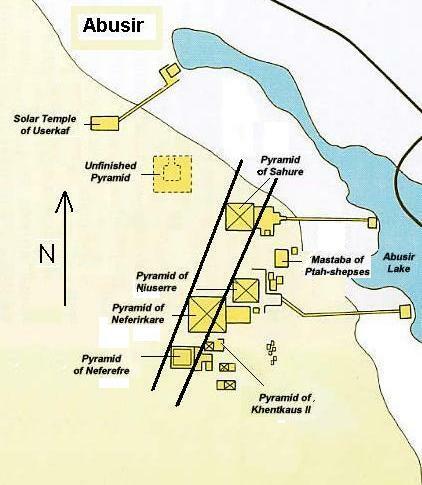 These alignments are found at Giza (south-east corners of Khufu, Kaphere and Menkaure), Abusir (north-west-corner of the pyramids of Sahure, Neferirkare und Neferefre), Saqquara (south-east-corners of Sekhemkhet, Djoser, Userkaf und Teti) - and even between necropolises as Goedicke thinks that the east face of Userkaf's Pyramid is aligned with the same face of Khufu's Pyramid several kilometres to the north. Goedicke later concluded that these sight lines were aimed at the solar temple at Heliopolis. 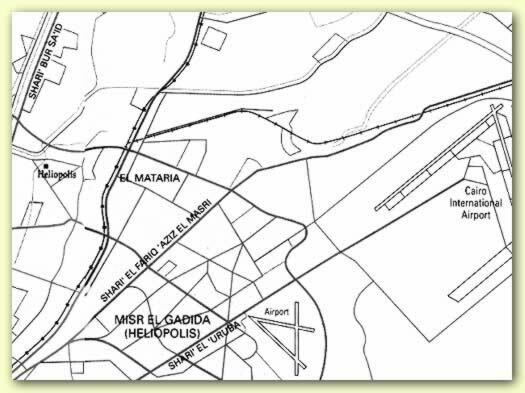 'As a precise geodetic measurement has confirmed, its northwest corner is on a line that already connected Sahure's and Neferirkare's pyramids and represented the basic axis of the pyramid necropolis at Abusir' (3). The exact origins of Heliopolis are sadly lost to us at present, but the fact that it is included in the creation myth gives it an obvious importance that extends back to pre-dynastic times. In the Old-Kingdom Heliopolis was a centre of astronomy, as reflected in the title of the high priest who was called the 'chief of observers'. By the time of the Middle-Kingdom, it had become the centre of the cult of Amun-Ra (following the association pf Atum and Ra/Re). Donation lists from the time of Ramases II indicate that the temple at Heliopolis were second only to that of Amun at Thebes. The city was largely destroyed in the Persian invasion of 525 BC. The significance of the city was lost following the founding of Alexandra in 332 BC. The old monuments were plundered and the remains were used as a quarry for building much of medieval Cairo, and other civil projects since. When Strabo visited the city (1st cent BC), he found it almost deserted. Diodorus Siculus wrote in 60BC that Heliopolis was built by Actis, one of the sons of Helios and Rhode. Though only fragments of Heliopolis’ city walls remain, they were easily discernable at the time of the French Expedition in 1798, portions of these walls stood ten to twelve meters high. Today, all that remains of this once great city is the single (20.4m high, 121 ton), obelisk, originally one of a pair erected at the entrance of a huge temple to mark the 12th dynasty king Senusret I's 30th anniversary at around 1940 BC. (and a few granite blocks bearing the name of Ramesses II). According to Heliopean tradition, the first act of creation occurred when the sun god Atum, "Lord of Heliopolis", rose out of the chaos of Nun from a lotus flower and stood on a raised mound he created, the ben-ben. This first act of creation brought light into the world. At the site of his emergence, the temple of Heliopolis was built. 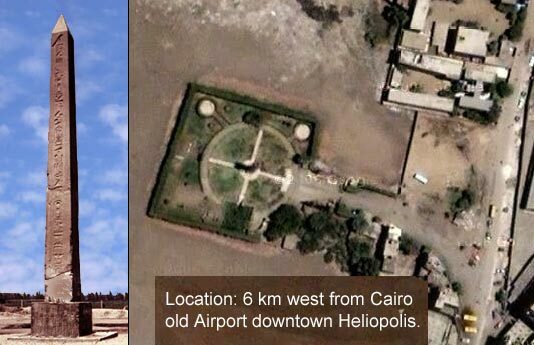 Heliopolis is where the cosmic creation of Egyptian myth began. Ancient Egyptian mythology states that in the beginning of time everything began with Nu. Nu is the description of what the planet was before land appeared. Nu was a vast area of swirling watery chaos and as the floods receded the land appeared. The first god to appear out of this watery mess was Atum. Atum emerged from Nu as the sun god at the beginning of time and is the creator of the world. Since Atum was all alone he chose to mate with his shadow. Atum gave birth to two children by spitting out his son (Shu) and vomiting up is daughter (Tefnut). (Or by masturbating them, depending on version), Shu represented the air and the principles of life and Tefnut represented rain and principles of order. The three remained in the watery chaos of Nu and after some time Atum was separated from his children. When they were finally reunited, Atum wept with tears of joy. When his tears hit the ground men grew and he then began to create the world. Shu and Tefnut later gave birth to Geb, the god of the earth in which the throne of the Pharaoh would be decided. Nut was also born from Tefnut and Shu as the Goddess of the sky, the separator between earth and Nu. Geb and Nut then gave birth to Osiris, Isis, Seth, and Nephthys. Atum is known also as Khepri, the great scarab beetle, Ra-Harakhte, the winged-solar disk, Ra, the midday sun, Aten, the solar-disk, or Horus on the Horizon. By whatever name you call him Atum, is the one and only creator in the universe. The sun god Atum travels along Nut during the day and then is swallowed by Nut at night. At dawn it is seen as Nut giving birth to Atum as the sky opens up to the light. References to Heliopolis in the Bible. Ezekiel (30:17) - "The young men of On and of Pi-beseth Will fall by the sword, And the women will go into captivity. 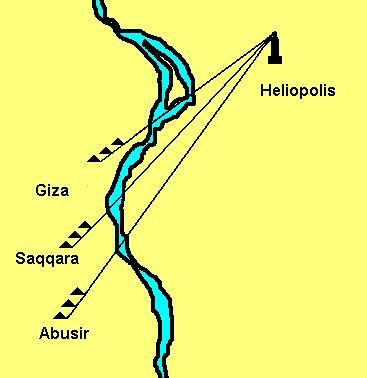 On was the name for Heliopolis in the Bible. Beth-shemesh is, "the house of the sun," in Hebrew; called by the Greeks "Heliopolis". 2). The Historical Library of Diodorus Siculus, Book V, ch.III.